National Instruments Aust & NZ announces the expansion of the NI FlexRIO product family, built on FPGA-based reconfigurable I/O (RIO) to more than 20 modules. NI’s six new adapter modules add I/O including digitizer, signal generation and IF and RF transceiver capabilities. These NI FlexRIO adapter modules can be paired with user-programmable FPGAs to solve almost any test application from real-time spectrum monitoring and RF modulation/demodulation to signal intelligence and RF communication protocol prototyping. Benefiting from the parallelism and dataflow programming of the NI LabVIEW RIO architecture, these modules can be easily targeted by engineers without VHDL or Verilog knowledge. The combination of NI FlexRIO, LabVIEW system design software and access to more than 600 NI PXI modular instruments gives engineers a commercial off-the-shelf solution that can be customised using FPGA technology. Charles Schroeder, director of test systems at NI explains that their recent investments in user-programmable FPGA instrumentation, as illustrated not only through these new NI FlexRIO adapter modules but also with the NI PXIe-5645R vector signal transceiver, help demonstrate NI’s empowering vision for redefining instrumentation. He adds that the NI FlexRIO platform, through the NI LabVIEW RIO architecture, enables customers to create some of the most powerful test, research and embedded systems. 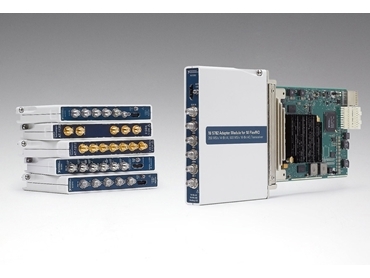 Typical applications for the NI FlexRIO adapter modules include pulsing, light detection and ranging (LIDAR), high-resolution edge detection, broadband RF acquisition, real-time spectrum monitoring, custom modulation and demodulation, bit error rate testing, signal intelligence (SIGINT), real-time spectrum analysis, RF communications protocol prototyping, RF record and playback, SIGINT and channel emulation among others.